Nalboor Tiles Porcelain Tiles Porcelain Tiles With a Wood Grain Finish: Better Than Hardwood? Porcelain Tiles With a Wood Grain Finish: Better Than Hardwood? Hardwood floors are popular for their warm look and sophisticated feel, but people often worry about them wearing down. While hardwood is a durable choice for any home, high heels and even your dog’s nails can damage it. Some damage can be fixed in place, but there may come a point where an entire section needs to be replaced. If this happens, you could be facing high repair bills and a time-consuming process. People who are worried about damage may opt to install ceramic tile as a durable and attractive alternative. One great benefit of ceramic tiles is that they can easily be replaced if a few tiles should become damaged. In the past, you would have to choose to go with the warm look of wood or the durability and easy replacement features of ceramic, but you can now have the best of both worlds. With ceramic tiles that feature a hardwood finish, you can have the cool feeling and easy maintenance of tile along with the warm, sophisticated look of hardwood. If you’ve been on the fence between hardwood and tile, here are just a few reasons you may want to take the plunge with porcelain tiles that feature a wood grain finish. We’re able to provide you with ceramic tiles that look incredibly similar to hardwood floors. While you may be able to see the difference when you get right next to the tile, most people will see the wood grain and believe that you’ve installed hardwood in your home. This means that if you want the look of hardwood, you no longer have to surrender the look you love to get the finish you need. Don’t confuse ceramic tiles with laminate strips. One of the problems with laminate strips is that the location of seams can stand out and make it obvious that you’ve chosen a laminate floor rather than quality wood. Ceramic tiles are made as individual pieces to be installed in a staggered pattern like hardwood. You can go with a very balanced approach that’s similar to laying bricks, or you can stagger the seams more for a look that’s closer to natural hardwood. You can also create cool patterns including herringbones and borders with the versatile porcelain tiles. This allows you to give every area of your project a unique look that you’re sure to love. Talk to anyone who’s had hardwood for more than a decade and you’ll hear about the fading colors in traffic patterns. The sun fades wood, people routinely walking across it wears the finish, and time simply fades the look. You can spend time every few months washing and waxing the floor to protect it, but there’s only so much that can be done to stop the ravages of time and keep wood floors looking like new. One great benefit of ceramic tiles is that they don’t have this issue. The colors remain true despite exposure to the sun and foot traffic. They don’t scratch with regular use to reveal lighter colors beneath, and they can still look like new even after more than a decade of use. There’s also an amazing range of colors to choose from. You can go with a distress natural wood grain, a deep oak or a few different shades of cream or white. Make your space feel larger with a light brown wood finish, or go with a creamy wood tone that’s perfect for casual settings. You’ll have the look of natural grains without any of the extra maintenance. A common complaint with natural wood floors is that some wood species have a raised grain that you can feel under your feet. This can be uncomfortable for some people, and it’s certain to trap dirt. Porcelain tiles have a perfectly smooth finish that won’t hold dirt and dust in place. In addition to looking great and lasting for years to come, ceramic tiles are also easier to clean and maintain because of this smooth, glossy finish. Rather than going out and buying special cleaners, waxes and sealers, all you need is your favorite all-purpose cleaner that you’ve trusted for years. You may still choose to give your tiles a little extra protection by applying a specially formulated sealer once a year, but this is easy to do and takes less than an hour to do most rooms. One of the challenges of laying natural wood next to stone is that wood expands with temperature changes and stone is more stable. You’ll also have tongue and groove applications with most wood products, but stones are adhered to the floor with special mastics. With these tiles, your dilemma is solved. Porcelain tiles and natural marble stones are both stable materials that are installed directly on the floor with mastic. There’s no need for transition strips, so you can create more attractive patterns and fresh looks. People love hardwood because it can be finished one or two times, but it’s important to note that this is only the case when you’re dealing with surface damage. Deep gouges, urine stains, and water damage often go down beyond the nailheads, and the planks must be cut out of the floor and replaced by an experienced professional. The process is costly and time consuming, but it’s easier with ceramic tiles. If a tile cracks or sustains serious damage, it’s a relatively simple matter for most homeowners to remove one or more damaged tiles and replace them. We maintain a stable inventory, so you can count on us to have the replacement tiles you need in stock, or you can order extras so you have them on hand in case one becomes damaged. Once you make the decision to go with porcelain tiles that look like wood, turn to a wholesaler for the best rates. We believe in keeping our own costs under control so that we can pass substantial savings on to our customers. Contact us today for pricing and shipping information! Country Classic style old wood look porcelain tiles from Spain. At least 68 different prints. Top quality durable porcelain tiles. 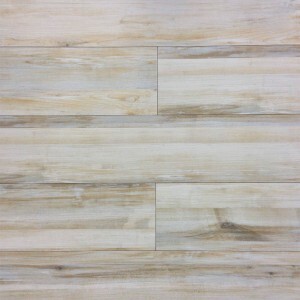 Spanish wood grain plank porcelain tiles. Minimum 68 different prints. 45" long planks will convert your space to a beautiful wood floor ambiance with the ease of use of porcelain floors. Vancouver Maroon is a rectified porcelain with wood grain finish. The lot has at least 68 different prints to provide the best desired natural wood look. These Spanish tiles are top of its line with durability and natural colors. 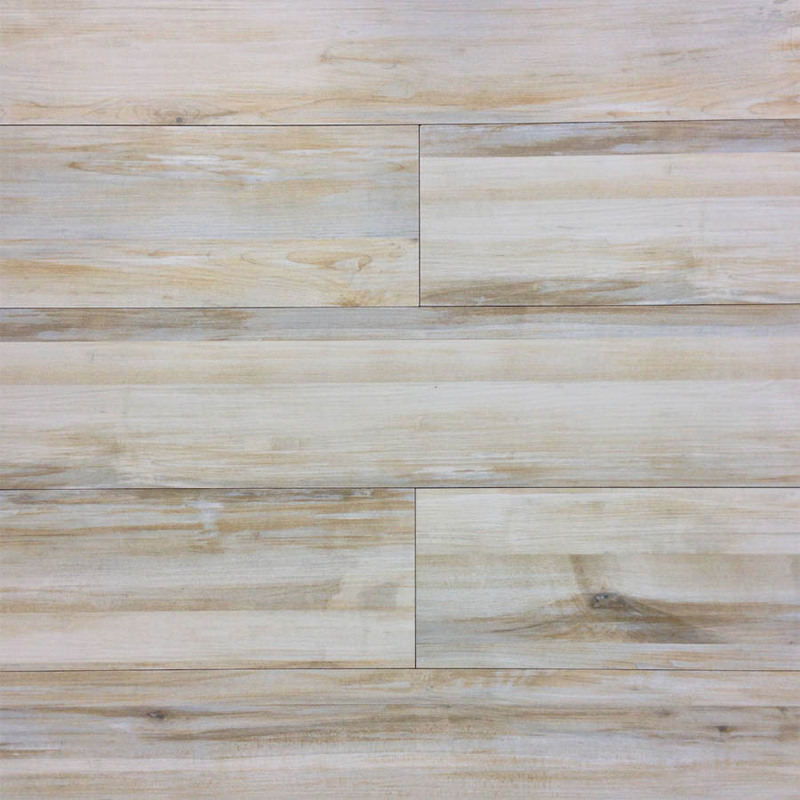 Wood grain plank porcelain tiles from Spain. This gold hue Crema Porcelain tile is rectified.